Janet was born and educated in Guernsey. 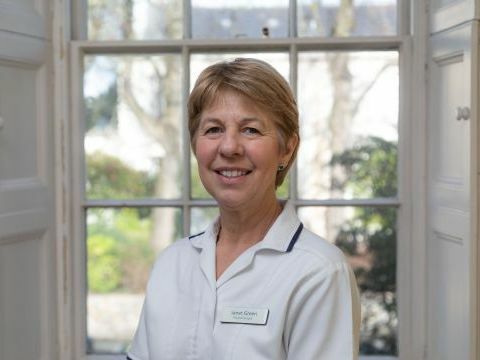 She trained at the Bath School of Physiotherapy and returned to Guernsey where she worked at a private practice for five years. After having her family she returned to work in 1992 where she joined the Queen’s Road Medical Practice. Janet has been a member of the Society of Orthopaedic Medicine since 1995, became an accredited member of the Acupuncture Association of Chartered Physiotherapists in 2005 and completed the four courses of the McKenzie Institute of Mechanical Diagnosis from 2010 to 2012. Janet has an in-depth knowledge of musculoskeletal injuries, including spinal pain, soft tissue/sports injuries and has a special interest in headaches with associated neck pain. Janet has also been a voluntary physiotherapist for the athletes at the Island Games in 2003, 2005 and 2011. Janet enjoys an active lifestyle of walking, cycling, gym classes and gardening.